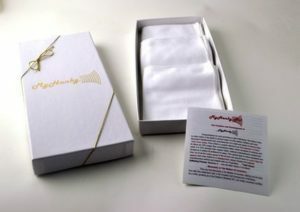 The seven hanky box contains seven 13 x 14 super absorbent hankies in plain white without our logo. The seven hanky box is a great deal! You Get seven of our high quality hankies for the price of six. Our plain white My Hanky is American made from 100% Pima cotton, the strongest and most durable cotton in the world. Order yours today and remember with hundreds of uses the My Hanky makes an amazing gift for friends and family. The women's seven hanky box contains seven 13 x 14 super absorbent hankies. The seven hanky box is a great deal! You Get seven of our high quality women's hankies for the price of six. The My Hanky Women's handkerchief is American made from 100% Pima cotton, the strongest and most durable cotton in the world. Order yours today and remember with hundreds of uses the My Hanky makes an amazing gift for friends and family.